Leading Hotels had an incredible product and competent ads. But the branding was stale and did not generate an emotional spark to ignite interest in a vacation nor did it encourage discovering the wealth of new online content. It did not speak to the hearts of travelers. The new brand needed to tell an authentic story and provide an outlet for action. All wrapped in a memorable brand that could inspire a new generation of guests. And lead them to begin a quest for something inspired. • Affluent frequent travellers looking for something special, unique, original. • Markets – North & South America, Europe, Russia, Middle East, China, SE Asia, South Africa, Australia. • Female decision makers for leisure travel. • 65/35 Men to women for business travel and golf. • Independent. Adventuresome. Seeking a story. Looking for inspiration. • Develop an experiential rebrand to drive online bookings. • Position uniqueness. Lifestyle interests. • Adapt global creative lo local seasonal and ethnic needs. • Develop elegant co-op to stretch the budget to cover 3 new continents. 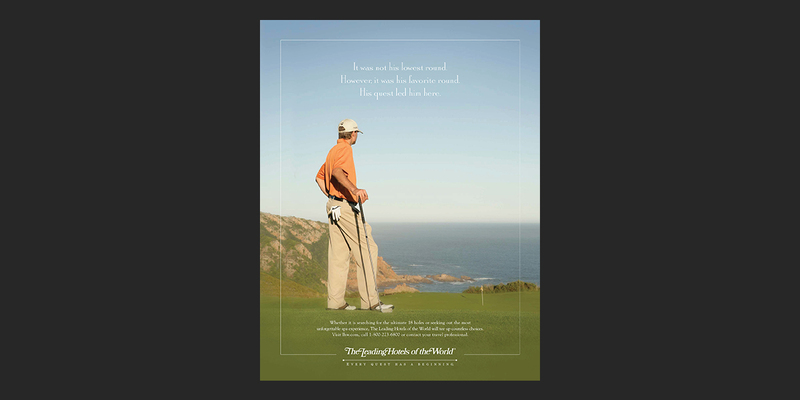 • Use print, digital and television to tell the story and wrap the story around online discovery. Develop the largest multi-channel global branding campaign in the history of LHW with turnkey tactical components and and a fully integrated co-op program. TV, Print, Interactive, Collateral and Direct Mail. Messaging tailored by segments: Leisure, Business, Group, Travel Trade, and by Lifestyle Interests (Golf, Shopping, Arts & Culture, etc.) Lifestyle interests were addressed on branded microsites to reduce bounce rates and increase bookings. The experiential brand focused on fulfilling emotional quests – the quest to try something new and authentic. We challenged people to think about special moments and to seek out the authentic experiences LHW offered. We invited people to begin their quest at LHW.com. We told stories and connected with consumers. 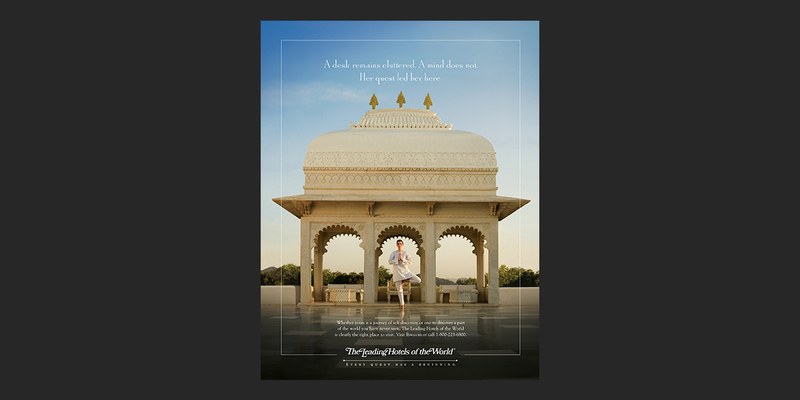 We showcased exotic locations in India and Africa and created visual and written narratives. We ignited the spark and began the quest for our consumers. The goal was to increase online bookings by 6-8%. They rose 26% in the first 3 months and 38% for the first year. 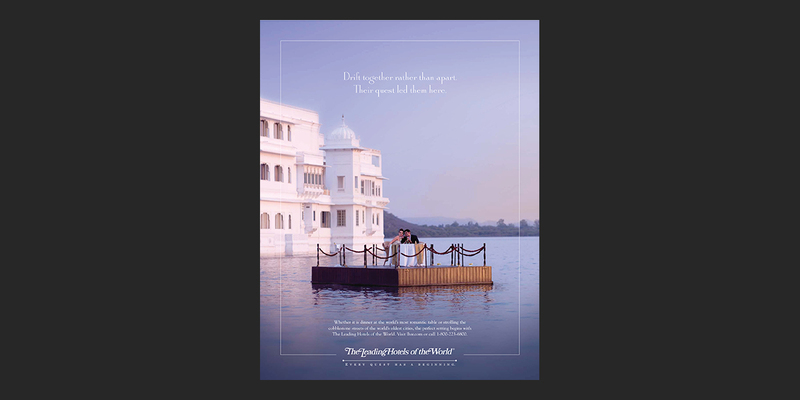 The campaign won many awards including 2 Best of Show honors including the Departures- HSMAI award for best and most effective luxury travel campaign. Perhaps most important, new travelers connected and loyal customers reconnected with the brand.